Self-publishing is much faster than traditional publishing. But can you create a quality book that way? Yes, but only with a disciplined process and the right support team. 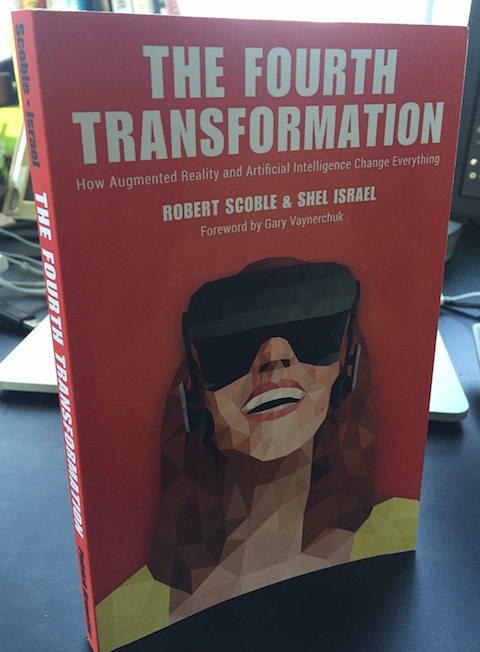 Here’s my insider’s account of how Shel Israel and Robert Scoble pulled it off with their new book book, The Fourth Transformation: How Augmented Reality and Artificial Intelligence Change Everything. Shel and Robert are a great writing team. They published their first book together, Naked Conversations, with Wiley, a traditional publisher. But they skipped the publisher for their next collaboration, Age of Context, and for Shel’s most recent solo book, Lethal Generosity. As I learned, they’ve got the process down to a science. But how do you maintain quality without a publisher? That’s the topic of this post. The role of the editor here, as in any project, is to help the writer to be as effective as possible. I did that for Shel and Robert. Shel contacted me in July about editing the book. Normally, you’d want the editor’s perspective at the start of the process, not when the actual writing is well along. However, in this case, Shel and Robert were so familiar with each other and the material that they were pretty confident with the path they were on. Before agreeing to participate, I reviewed a draft of one chapter. This allowed me to make sure I wasn’t going to set foot into an unworkable disaster (I wasn’t), to estimate the amount of time it would take to finish the project, and to make sure I had the time and temperament to work with them. I spent most of the summer and early fall reviewing drafts and providing feedback. My first draft reviews focused on conceptual and structural problems, inconsistencies, and arguments that weren’t strong enough. In the second pass, I focused on line- and word-editing, sentence structure, and proof points. Shel, who did most of the writing, is a total professional and worked like a demon, because they were crashing toward a deadline: they needed books in Australia in December for a speech. The original plan was to create a pre-release version in December and publish the final version in February. Shel’s assistant Karelyn Lambert managed a number of tasks including corralling link references. A copy editor, whom I sourced, review the final manuscript for errors. I created an index. I was efficient at that, since I knew the content intimately. Nico Nicomedes created the cover. He had done covers for Shel’s previous books. Remember, the cover art is not just the cover image; it has to wrap around the whole book and includes the back cover. Shawn Welch did the page layout and eBook production and submitted the book to Amazon. Shawn continually amazed me with how quickly and professionally he turned text into pages. His process is way more agile than anything I’d ever seen at a traditional publisher, and I know the process well; I used to run print production for a publishing company. Shawn’s book with Guy Kawasaki, APE: Author, Publisher, Entrepreneur, is the go-to reference for self publishing. Jeffrey Kafer narrated the audiobook. With Shawn’s help, they published the book on the Amazon CreateSpace platform. You can hold this book in your hand now; it looks great and reads well. On Amazon, 32 of 36 reviews are five stars. Things went so well that Shel and Robert moved up the pub date. They scrapped the plans for a pre-release version and just published the book on December 8, two months ahead of the original planned pub date in February. Try doing that with a traditional publisher. Shel and Robert are efficient promotion machines. That’s the other thing that made this work — once Robert Scoble cranks up the promotion, a whole lot of people are going to hear about it. And when you publish like this, the authors get more than twice the royalty rate they’d get with a traditional publisher. An advance (on royalties). Traditional publishers pay you thousands of dollars up front. My most recent book got a six-figure advance, for example. With the self-publishing approach, you start by paying people, not getting money: the editor, the cover designer, the copy editor, and the book production people, for example. In Shel and Robert’s case, they defrayed some of the cost by selling sponsorships; the sponsors’ logos appear in the first few pages of the book. A hard cover. Amazon CreateSpace books are print-on-demand paperbacks; they actually print each copy after you buy it. They don’t feature glossy covers like the paperbacks you buy in a bookstore, but they still feel like a quality product. Before you go this route, buy Shel and Robert’s book, or Shawn’s, and make sure the quality matches what you’re looking for. Broad distribution. You can buy this book only from Amazon. It’s not in bookstores, airports, or newsstands. The eBook is not on Nook or Apple’s iBook store. Most business books and ebooks go through Amazon, but not all of them, and when you publish this way, you limit people’s ability to discover the book. The publisher’s publicity team. Publishers put varying amounts of effort behind books; sometimes they do great, and often they don’t. But without them, it’s hard to get your book reviewed by newspapers, for example. You either need to hire a publicist to backfill, or use nontraditional publicity methods like social media. Foreign rights. Publishers are adept at selling translations. You can hire a foreign rights rep, but that’s yet another thing you’ll have to manage. This matters less than it used to, because the market for translations has wilted in the last few years. So it’s a tradeoff. You won’t have a big check right away or a beautiful hardback book in Barnes & Noble. But you’ll also have more control of the content and, most importantly, you’ll get to market a lot faster. If you’ve got the experience, the team to support you, and the promotional chops, consider publishing the way Shel Israel and Robert Scoble did — without a publisher.